The past 50 years have seen the development of three major model series with a total of ten model ranges, countless variants and a production volume of more than 4.5 million vehicles – vans exemplify both long-standing tradition and outstanding success at Mercedes-Benz. It is not for nothing that the brand bearing the three-pointed star leads the field in this segment. 50 years ago, the then Daimler-Benz AG presented its first modern van, the L 319, at the IAA show. It signalled the start of a success story that continues to be written to this day. Now, half a century later, Mercedes-Benz offers three attractive model series to meet van customers' diverse requirements. There is a prehistory to what began 50 years ago. Karl Benz and Gottlieb Daimler, who, in quick succession and independently of one another, invented the motor car, the bus and the truck, were responsible for developing the forerunners of modern vans well over 100 years ago. In 1896 Benz presented his "combination delivery vehicle" and, one year later, Daimler revealed his "business vehicle". Both vehicles would today be classified as vans. In 1927, the first joint truck range launched by the recently founded Daimler-Benz AG included the L1 light truck with 3.5 t gross vehicle weight. The legendary Lo 2000 with 5 t gross vehicle weight was launched in 1932 and was also a forerunner of the vans of the 21st century – as was the L 1100 a few years later. Facing difficult conditions in the aftermath of the Second World War, Daimler-Benz mobilised all its resources to modernise its range of light and heavy trucks. During the early period of the "Wirtschaftswunder" (economic miracle), however, there was a growing demand in trade and industry for compact commercial vehicles. Daimler-Benz responded by presenting its first true van at the IAA show in 1955. The L 319 had a gross vehicle weight of 3.6 t and entered series production the following year. The resilient technology of the L 319 satisfied the demanding requirements of its no-nonsense clientele: a load-bearing ladder-type frame for the chassis and pickup versions (the panel van featured a partially self-supporting body), rigid front and rear axles with leaf-spring suspension, twin tyres at the rear axle and large 16-inch wheels. The L 319 was also famous for its distinctive visual appeal, with its strikingly curved, single-piece panoramic windscreen and small side windows ahead of the A-pillars, the oval grille and the forward position of the front axle for easier access to the cab. The L 319, a cab-over-engine model, was powered by relatively conservative four-cylinder power plants. Initially a pre-chamber diesel engine taken from the 180 D passenger car was the only power plant. It produced 43 hp with a displacement of 1.8 litres. Soon after this, a petrol engine from the Mercedes-Benz 190 with a 1.9-litre displacement and 65 hp was added. Power transmission to the rear wheels was handled by a four-speed gearbox; the gear lever on the steering column can be regarded as a forerunner of the joystick used in today's Sprinter. 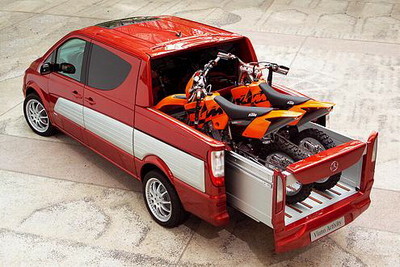 Although only 4.8 metres long, the panel van offered an impressive 8.6 cubic metres of load volume. During its life, the pioneering van saw changes both to its engines and its model designation. In 1963, the internal designation L 319 was replaced by the naming system based on tonnage and (rounded) power output in hp which is still in use today. The van that had started life as the L 319 was known as the L 408 and L 406 when the main production activity ceased in 1968 (vehicles continued to be assembled in Spain until 1970). Some 140,000 vans of the series had been built, including the elegant O 319/O 319 D buses. The production site also changed: in 1962 the L 319 moved from Sindelfingen to Düsseldorf. Production of the bus model of the same series (the O 319), which had previously been built in Mannheim, also moved there. The former Auto Union plant in Düsseldorf later became the primary van production plant for Mercedes-Benz in Germany. As had happened a dozen years earlier, the sixties witnessed a surge of innovation that ultimately produced new vans. 1967 saw the arrival of the L 406 D, the successor to the first Mercedes-Benz van. Characteristic visual features included the short engine hood (hardly more than a suggestion, in fact) as the engine extended a considerable distance back into the cab to save space. Another distinctive feature which was inherited from its predecessor was the forward position of the front axle to facilitate cab access. The sweeping panoramic windscreen was replaced by a large rectangular windscreen, supplemented at the sides, as before, by small windows. In keeping with the period, the basic shape of the new model was angular, a theme picked up by both the radiator grille and the rectangular headlamps. Behind the model designation L 406 D was a vehicle with a GVW of 3.5 to 4.6 t and an output of 55 hp from a 2-litre diesel engine (the same power plant that was used in the Mercedes-Benz 200 D passenger car). But this was not the end of the story: little by little the product range was extended and by 1977, ten years after it made its debut, it included the L 613 D with 6.5 t GVW and a 5.7-litre six-cylinder truck engine which developed 130 hp. The optionally available petrol engines were of little significance in the German market. Bus variants also featured in the new series. In keeping with the typical Mercedes-Benz bus designations of the day, the bus model was marketed as the O 309 D.
Using names in place of cumbersome designations for commercial vehicles was not yet commonplace at Mercedes-Benz during this period. People in the know would therefore often refer to the vans according to the sites where they were manufactured. This is why the large Mercedes-Benz van was simply called the "Düsseldorfer". A very different model was the more compact "Bremer" van, which represented a new range initially built from 1977 onwards at the Bremen production plant. Subsequently, the Düsseldorfer was also internally labelled "T2" – the designation for a large-capacity van. The Düsseldorfer/T2 proved to be a perennial success and was built for almost 20 years. By 1986, just short of half a million units plus parts kits (assembled in Spain, Argentina, Iran, Turkey and Tunisia) had been produced. By this time, a number of new van models had long since become established alongside the Düsseldorfer. Having had a majority holding in Hanomag-Henschel (a new brand formed by the merger of long-established companies) since 1969, Daimler-Benz AG took full control of the company at the start of 1971. This move brought the Henschel plant in Kassel into the Daimler-Benz Group along with the production plant for the Tempo delivery van in Hamburg and the former Borgward plant in Bremen, both of which had been part of Hanomag. As a result, Mercedes-Benz had acquired a second, already well-established van range comprising medium-capacity vehicles from Hamburg and Bremen based on the earlier Tempo Matador model. Originally developed by Hanomag as the F 20 to F 36, the van range from 2.4 to 3.3 t GVW went into production – in slightly modified form – as the Mercedes-Benz L 206 D and L 306 D while the original Hanomag models continued to be produced in parallel. It goes without saying that the Mercedes-branded models featured the three-pointed star on the radiator grille while Mercedes-Benz diesel engines were fitted under the cabs. Initially restricted to the well-known two-litre four-cylinder unit with 55 hp from the 200 D, the range of diesel engines was later extended to include the 60-hp unit from the 220 D. Five years after the takeover, the two-brand strategy was abandoned and the vans, which were manufactured exclusively in Bremen from 1976 onwards, were available as Mercedes-Benz products only. By the end of the seventies, the two brands' combined output amounted to almost 304,000 units, of which 165,000 were Mercedes-Benz vehicles. Meanwhile, behind the scenes, a completely new van featuring what are now typical Mercedes-Benz characteristics was beginning to take shape. 1977: a new best seller, the "Bremer"
In 1977 Daimler-Benz sent the former Hanomag vans into retirement. Their design and engineering were no longer really compatible with the company's style and engine line-up. The time was right for the emergence of the Bremer van (or "Bremer" for short) as it was referred to internally because of its origins. It was also labelled the T1 or TN, an abbreviation for "Transporter neu" ("new van"). The new models embodied the now firmly established principles for vans bearing the three-pointed star: the rear wheels were driven by a front-mounted engine which was housed beneath a short hood and extended some way into the cab in order to save space. In contrast to predecessor models with tubular frames, the closed body versions featured an integral design based on a torsionally rigid floor frame and a load-bearing body. Daimler-Benz used this design as the basis for the development of a huge range of vehicles. These included models with 2.55 to 3.5 t GVW (later also 4.6 t with twin tyres), diesel engines starting at 48 kW (65 hp) for the 207 D/307 D and eventually rising to 70 kW (95 hp) in the 210 D/310 D and 410 D with four and five cylinders, several wheelbases and numerous body, door and window variants. The Bremer quickly developed into an all-rounder in its weight category. The chassis with its leaf-sprung rigid front and rear axles made this a particularly robust model range while the positioning of the doors behind the front axle – by now a well-established characteristic of the brand – made accessing the cab particularly easy and comfortable. The new van also signalled a turnaround in terms of visual styling: with its distinct and timeless body design, this was the first Mercedes-Benz commercial vehicle to feature inclined lower window edges in the cab. This signature styling feature became established over the years throughout the model range, right up to the heavy trucks. The Mercedes-Benz T1 formed the backbone of the company's vans for a period of 18 years. The best seller in its category, it only just fell short of the magical million mark with its total production volume of 970,000 units. In its latter years, it was strictly speaking no longer a Bremer. Between 1980 and 1984, production was progressively transferred to Düsseldorf, which thus became the central Daimler-Benz van production plant in Germany for a number of years. In 1987, the van range in Central Europe was expanded to include the MB 100 D, a new compact van. It originated from Vitoria in the Basque region of northern Spain and was part of the MB 100 D to MB 180 D range which had been launched on the Iberian peninsula one year previously. This placed the spotlight on a plant and products that had previously been virtually unknown to the public outside south-west Europe. In 1958, the then Daimler-Benz AG took over Auto Union, and in so doing acquired a van production plant in Spain where DKW vans had been built since 1954. This independent range was continued by Daimler-Benz which retained the core product characteristics: cab-over-engine vans with front-wheel drive and a tubular frame. The two-stroke engines were replaced by Daimler-Benz diesel engines, however. Following a number of model changes, the MB 100 D to MB 180 D range was launched on the market with vans up to 3.5 tonnes. In central Europe the MB 100 D was introduced. Typical features for this van included the angular body and a number of technical characteristics which reflected the origins of the model series: a tubular frame, a cab-over-engine design and front-wheel drive. The engine, a typical Mercedes unit, was the familiar four-cylinder diesel from the 240 D passenger car ("Taxidiesel") which generated 53 kW (72 hp) and had a displacement of 2.4 litres. After receiving an external facelift several years later, an MB 100 D attracted attention as a technology showcase vehicle in 1994: the NECAR (New Electric Car) was the first road vehicle in the world to be powered by a fuel cell. The NECAR remained a one-off but no less than 207,000 units of the entire model series were built in Spain. In parallel to the Spanish van production activity, engineers in Germany developed the successor to the "Düsseldorfer", which, due to the relocation of the second model series to Germany's Rhineland region, was now simply referred to as T2. In 1986, nine years after the launch of the successful T1, it was no wonder that the new T2 looked like the T1's big brother: a clearly designed angular body with a short hood and large windscreen, side windows with an inclined lower edge, a four-cylinder engine extending partly into the cab and a robust chassis with rigid axles and leaf-spring suspension – the similarities were anything but superficial. Since the T1 line-up extended to a maximum GVW of 4.6 t by that stage, the T2 also offered an expanded GVW range from 3.5 to 7.5 tonnes. With its four-cylinder diesel engines ranging from 53 kW (72 hp) to 100 kW (136 hp), a host of rear-axle ratios, panel-van variants and a very varied range of chassis versions, not to mention all-wheel-drive models for the construction and forestry industries, the robust series successfully filled the gap between traditional vans and light trucks. Initially based at the traditional home of Mercedes van manufacturing in Düsseldorf, production of the T2 relocated to Ludwigsfelde in Brandenburg (south of Berlin) following German reunification at the beginning of the nineties. During the ten years to 1996, 138,464 vehicles from this model series were built at the two production plants. With sales figures just short of the million mark, the T1 was the clear best seller amongst Mercedes-Benz vans. In the spring of 1995, the T1 found a worthy successor in the shape of the Sprinter. It was the first Mercedes-Benz commercial vehicle to be assigned a name instead of an abbreviation or a simple numerical code. This time, the sequence of cause and effect was reversed: the new and successful van heralded an unparalleled wave of renewal which touched all the company's vans and truck models in Europe. With its longitudinal front-engine layout and rear-wheel-drive system, the Sprinter adopted the basic technical concept of its predecessor. However, all the other features were new: the body, the cab and, not least, the technology. The chassis, with independent front suspension, placed equal emphasis on comfort and safety. With powerful diesel engines up to 90 kW (122 hp), the Sprinter did its name credit by assuming the leading position in its segment. A comprehensive range of features was provided to keep all this power safely under control: disc brakes all round as well as the standard-fit anti-lock braking system (ABS) and automatic brake differential redefined van standards. Initially offering 2.55 to 4.6 t GVW and almost countless body and wheelbase variants, the Sprinter made versatility a priority. Through an expansion of the range with open model variants in 2001, its peak GVW was further increased to six tonnes. A year before that, the Sprinter was equipped with new four and five-cylinder engines boasting common-rail direct injection, multi-valve technology and a power output of up to 115 kW (156 hp). An alternative to manual and automatic transmission was offered by the Sprintshift automated transmission system. The shift lever or selector lever was fitted in the instrument panel in all models to save space. And with the introduction as standard of the Electronic Stability Program (ESP) and the Brake Assist System (BAS), the Sprinter once again set new standards for active safety in 2003. Market success speaks for itself: today the Sprinter is built not only in Düsseldorf, but also in Argentina and Vietnam; assembly of the vehicles also takes place in the US. In Europe, vehicles of its size have long been referred to as the "Sprinter class". No wonder, considering that 1.3 million vehicles have been manufactured and are in use in well over 100 countries. This makes the Sprinter the best seller among the numerous Mercedes-Benz van model ranges over the past 50 years. Sprinters with hybrid and fuel-cell drive systems are now undergoing customer trials. Together with the "Safety Showcase" vehicle study, these innovative solutions offer a glimpse of the future of medium-capacity vans. Looking beyond commercial use, the Sprinter also enjoys great popularity as a basis for upmarket camper vans. In particular, the Sprinter James Cook, converted by Westfalia Van Conversion, a subsidiary of DaimlerChrysler AG, has long since achieved cult status. Its regular, unchallenged selection as camper van of the year in its category reinforces this position. If the Mercedes-Benz MB 100 D was angular in appearance and adopted many technical features of its predecessors, the new Vito broke with these traditions when it was launched in the autumn of 1995. The only typical characteristic to remain was the front-wheel-drive layout. The body of the compact van in the 2.7 t GVW category was wedge-shaped and distinctly dynamic, making it appealing to both commercial and private buyers as well as mixed users. This simplified the parallel development of the V-Class MPV, which was targeted at upmarket buyers with extensive space requirements. As early as 1997, the success of the Vito was so resounding that it was being produced around the clock in three shifts at the Vitoria plant. An intensive model facelift and the introduction of CDI diesel engines with common-rail technology and a power output of up to 90 kW (122 hp) in 1999 gave the Vito and V-Class further impetus. By the time the model range was replaced in the summer of 2003, around 560,000 Vito and V-Class vehicles had left the Vitoria production plant. Launched in 1996, the new Vario large-capacity van offered an innovative combination of the strengths of a light truck with the benefits of a van. It was characterised by a high payload and a load capacity of up to 17 cubic metres as well as a robust design, powerful turbodiesel engines up to 100 kW (136 hp) - and subsequently even 112 kW (152 hp) – as well as optional air suspension for the rear axle. The functional basic design with a short engine hood was retained. The body, however, underwent a thorough facelift. Today, the Vario offers vehicles spanning 5.9 to 7.5 t GVW as standard. This range can be extended from 5.0 to 8.2 tonnes by means of the load uprating/downrating options. Engine outputs range from 100 kW (136 hp) to 130 kW (177 hp); the most powerful unit generates an impressive maximum torque of 675 Nm. Up to four wheelbases, body variants for panel vans, panel vans with a passenger compartment as well as a range of chassis versions meet the requirements of prospective customers looking for a particularly robust large-capacity van or light truck with a high payload capacity. Internally ventilated disc brakes all round and an optional retarder reinforce the Vario's outstanding level of safety. With the launch of the new-generation Vito in 2003, Mercedes-Benz raised the bar in the compact van segment. Two wheelbases, three lengths and two roof heights, two GVW variants (2.77 and 2.94 tonnes) as well as extensive equipment and door variants form the basis for a model range with enough versatility to meet the most demanding individual requirements. The Vito van and Viano MPV were developed in parallel. Offering a host of variants, right up to the compact Viano Marco Polo camper van (converted by Westfalia Van Conversion), the Viano appeals to both commercial and private buyers. Rear-wheel drive and longitudinal engine layouts allow the company's comprehensive, modular range of power units to be fitted and at the same time afford the Vito and Viano superb agility and handling. The economical and powerful CDI diesel engines with common-rail technology offer power outputs from 65 kW (88 hp) to 110 kW (150 hp); at the top end of the Vito and Viano engine range is a V6 3.7-litre petrol engine with an output of 170 kW (231 hp). Power is delivered to the rear wheels via a six-speed manual transmission (with a joystick-type shift lever) or an automatic transmission (standard in models with a petrol engine). Maximising power and minimising environmental impact: the low-emission petrol engines already comply with the EU 4 standard. The Vito and Viano with diesel engines are the first vehicles in their class which can be specified optionally as EU-4-compliant. The Vito and Viano CDI are also the first vans and MPVs available with a particulate filter – this has been fitted to the Viano as standard in various countries (including Germany) since summer 2005. The Vito and Viano are not only powerful and clean, but also exceptionally safe. Their basis is a chassis with independent suspension and coil springs. The Vito and Viano standard specification also includes large disc brakes all round, anti-lock braking, acceleration skid control, electronic brake force distribution and the Brake Assist System. Furthermore, they are the only vehicles in their class to be equipped with the Electronic Stability Program (ESP) as standard. The Vito also features a driver airbag while the Vito crewbus and Viano boast both driver and front-passenger airbags. The Vito and Viano are yet to reach the peak of their career. This is demonstrated by new variants such as the Vito 4x4 and Viano 4Matic with permanent all-wheel drive, which will enter series production next year. The Viano X-clusive study, which was presented at the IAA 2005, underlines the exceptional possibilities of the two model series. Powered by a V8 engine with 225 kW (306 hp), the Viano X-clusive accelerates to 100 km/h in a mere 6.8 seconds and can achieve a top speed of 240 km/h. A specially developed high-performance braking system brings this superlative Viano vehicle to a standstill just as quickly. Dynamic styling which evokes a sports saloon and equipment inspired by the business van market lend the study its unique character. The success of the Vito and Viano is reflected by the fact that the Vitoria plant in the Basque region of northern Spain is already working at full capacity producing around 90,000 vehicles each year on a two-shift basis. While Mercedes-Benz vans played second fiddle to their truck counterparts in the early years, this balance was redressed for good with the establishment of the Mercedes-Benz Vans business unit in 1995. Since then, the van sector has operated independently within the Commercial Vehicles unit – and extremely successfully, too: Mercedes-Benz vans hold a unparalleled market position in their segment in Europe. The market share amounted to 17.5 percent last year. Employing 13,400 staff, the business unit achieved a turnover of EUR 7.7 billion in 2004. The Vito, Sprinter and Vario vans and the Viano MPV are manufactured in Düsseldorf, Ludwigsfelde, Vitoria/Spain, Buenos Aires/Argentina and Vietnam. Final assembly for the north American market takes place in Charlston/USA, where the Sprinter is sold under the Dodge and Freightliner brands. A production plant in China will be added in the near future. The Van Technology Center (VTC) was opened in Stuttgart in 2005. It embodies the success and autonomy of the business unit by uniting virtually all its functions, including management, controlling, sales and development/testing, under one roof.